Trust me…you don’t EVEN want to know what this picture reminds me of…but trust when I say this stuff is GOOD! But there are some folks who have not yet joined our happy little social media community and don’t know about MiO. So I have come to be the MiO prophet. Turn away from your drink sticks people! There is a better way. I will show it to you!!! Think Crystal Light meets concentrated juice. It’s liquid and it comes in six flavors: Mango/Peach, Strawberry/Watermelon, Peach Tea, Berry/Pomegranate, Fruit Punch and Sweet Tea. Each “squirt” from the little bottle flavors 8 oz. of water. No calories, no sugar, no sugar alcohols, no carbs. Ok…I don’t get the appeal??? For those who think that Crystal Light is too damn sweet. You used to use just half a stick didn’t you? And storing that extra stick was cumbersome wasn’t it? With MiO, you can use one squirt (which, again, flavors 8 oz. of water) in however much water you like. So if 8 oz. + 1 squirt is too sweet, do 10 oz. + 1 squirt. Or 16. Or 20. I call this your water:MiO ratio. We each have our own. Find yours! For people who travel. Those drink sticks, again, are cumbersome unless you use all of it at one time. With MiO, you flip the top, squirt the liquid and…get this…you don’t even have to shake the water bottle. It does this cool cloud eruption thing (which for some reason evokes thoughts of Harry Potter and veritaserum) and in seconds your water is flavored honey! I’ve been in love with MiO for a few weeks now and can tell you that it’s easy to carry with you, easy to use in restaurants with that fateful glass of water. It’s just damn easy. Ok, so where do they sell it? And how much does it cost? I get mine from Wal-Mart (I looked and they do sell it on Amazon but for WAY more and you have to pay shipping. I only suggest it if you don’t have Wal-Mart near you). They are just over $3 a bottle and each bottle has enough liquid to flavor 28 eight-ounce servings. So it comes out about the same as the drink sticks. Yo, Nik, you haven’t mentioned…um…the taste??? Ok so far I’ve had the Peach/Mango (which is my reigning favorite). I get a lot of peach from that, not so much mango but that actually works for me. I’ve had strawberry watermelon (in that one the strawberry comes across stronger than the watermelon) and I’ve had the fruit punch, which is delightful. I don’t like blueberries or pomegranates (so shoot me!) so I’m not trying that one. La Grande Diva has tried both the peach tea and sweet tea and likes both. My younger girl has given up artificially sweetened drinks for Lent…so I’ll get back to you on her response. Have I convinced you yet? Are you putting on your jacket to go to Wal-Mart to get you some MiO??? No…well you’re missing out. It is FANTASTIC! I love that it doesn't matter what size water you have. You can not only easily adjust how much you use but its not a one size fits all powdered stick. You nailed it with the non-stirring thing. Amazing how it all swooshes around on its own! I am so glad that you reviewed this! I saw it in Walmart, but did not try it. I will have to try it now!! Thanks for your opinion. I love the Mio and have tried all flavors. My favorites are the berry pomegranate and the peach tea. What is the 6th flavor? 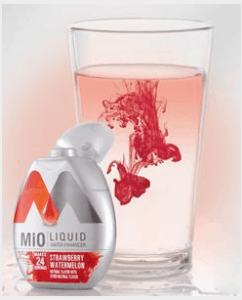 Jenn – You sorta have to play around with it to find your MiO:Water ratio! If you squeeze too soft it isn't sweet enough. Too hard and it's too sweet! I can tell the sweetness now by the color. Not too dark, not too light is just right! I like the sweet tea flavor. I'm still working on how much to squirt in a bottle of water, I like sweet sweet tea. I didn't like the strawberry/watermelon (got that as a free sample). I just bought the crystal lite pure…I'm going to try that tomorrow. Since my RNY I can only drink the crystal lite orange, all others make me nauseous. Not too sure about this one. I see it all the time but it looks like it screams too sweet. I'd have to learn the squeezing thing to get the amount just right before wasting many bottles of water. I love CL so if I can stray from that one day I might try it. Thanks for the review! I tried it and liked it (the berry pomegranate is actually pretty good and I'm not especially a pomegranate fan) but I do have a problem with it. One of the top three or four ingredients is propylene glycol. It's something people should be aware of, especially if they're conscious of how many chemicals they are putting into their bodies. Wow, this sounds really great! What section of WalMart did you find this in? Diet aids? Next to Crystal Light and KoolAid? Hi Misti. I found it in the same aisle as Crystal Light. Enjoy! I really love the strawberry/watermelon and the orange/tangerine. The orange is like drinking the old orangeades you use to get at the drugstores back in my day.